You can spot the cheery red Lobsta Truck from a mile away. It's one of my favorite trucks, graphically speaking. Simple. Striking. The food is simple and striking, too. Lobsta roll -- fresh lobster meat on a toasted split-top roll with mayo or butter ($12). We chose butter. It was all that it was advertised to be. Solid. 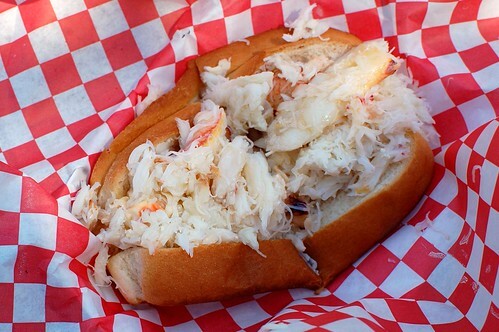 Crab roll -- fresh crab meat on a toasted split-top roll with mayo or butter ($12). We chose butter. I liked this even more than the lobster. 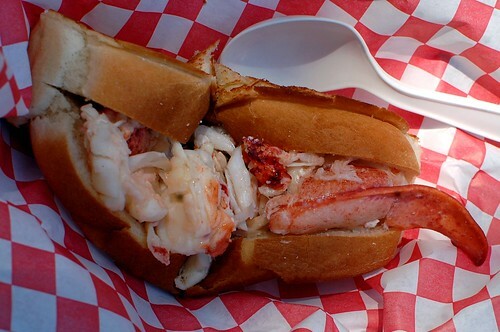 It's pricey for food from a truck, but Lobsta Truck doesn't skimp. Real, fresh, and ample. I wish they were bigger for the price, but I know that their supply costs have to be high. I needed a sandwich and a half to feel satisfied. Mr. Bumblebee adores Lobster Truck. The guys that work there are nice too. I love the chunks of lobster and crab. looks so good. i tend to like crab more than lobster, too. mm. Oh, man. Look at all that lobster and crab! Yum. man, i need to stop seeing pictures of these rolls! 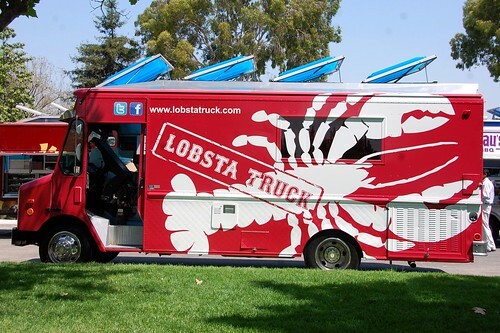 one of my junior league sisters is a co-owner of the lobsta truck. i've been so many times i could probably fly to maine for the cash i've dropped there. but oh, so good. butter is the only way to go.